Physics is considered troublesome by many students. To be honest, I have particularly seen this subject cause more headache than even mathematics in some cases. That’s because of the numerical, derivations, principles, concepts, complicated formulae associated with it. In here, I have listed a few of the most common mistakes made by students while solving physics problems. The main point of highlighting these little devils is to make students aware of these mistakes causing them to double-check everything during their examinations. Let’s go through them without further ado. This error is the most common of the lots. It’s a silly mistake on one hand but at the same time it’s troublesome on the other. This error usually occurs when students fail to read the problem in detail. Students must take into account all the unite present in the problem. And at the same time calculations need to be done in a consistent set of units. Meaning, if they follow the MKS system or the CGS system (according to the requirement or choice), they have to ensure that they do the entire calculation in respective to a specific system. Say, a problem contains two values, one in meter and another in hour. The student has to follow a MKS (Meter, Kilogram, Seconds) system to do the come to a result. Keep “meter” as it is (because it tallies the MKS system). Then s/he should continue solving the sum on basis of the above two values. This mistake usually happens due to the question itself. The main culprit behind this error is that the student was too careless to pay complete attention the problem in detail. The problem asks for an answer in the CGS system. The student over looks it completely and gives the answer in MKS. This results in zero marks even though the problem’s down correctly from the top to the bottom. Students have a tendency to think that most physics problems utilize degrees. Yes, most do but not all. Simple examples can be angular velocity and acceleration that utilize radians in their calculations. Those are the places you have to ensure that you use radians in your calculations. Keep these things in mind even when you use calculators. This is a pretty basic error that happens in physics especially when students are newly introduced to trigonometry. 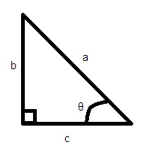 sin θ = opposite/hypotenuse= b/a. cos θ = adjacent/hypotenuse= c/a. tan θ = opposite/adjacent = b/c. I can explain this better with an example. In vector additions, suitable vector addition technique needs to be implemented. This means determining the result in 2 components. Many students make the mistake of summing up vector magnitudes without thinking that they should add the components instead. Latent heat’s the energy absorbed or released by a thermodynamic system resulting in a change in phase such as solid to liquid or vice versa etc. This heat’s ignored in many calculations resulting in a mistake. So you must not forget to take latent heat into account when you are involved in any physics problem involving phase changes. Kirchoff’s laws are usually used to calculate the magnitude of current in a circuit. Most errors occur in these problems because students make simple and silly mistakes with signs. The trick’s to get these signs right and you’ll come to the correct result in no time. These errors occur when students have to find out the total resistance of a circuit connected in series and parallel. When 2 resistors (say R1 and R2) are connected in series, R= R1 + R2. When 2 resistors (say R1 and R2) are connected in parallel, 1/R= 1/R1 + 1/R2. Ray diagrams are considered an integral; part of light. The most common mistakes students make in ray directions is the usage of wrong-directional light rays. While doing sums based on refraction, many students fail to get the angles right. Just remember that the angles are measured with respect to the “normal” (AKA perpendicular). Well, we have talked about all these problems for quite a bit of time; didn’t we? How about turning these problems into a part of the solution? Let’s go through a few thumb rules then. If possible, draw the diagram. Write down the list of information given in the problem in a tabular format on your sheet for calculation. Keep important formulae under your nose. List them systematically on your answer sheet during exams. Last but not the least; solve one variable at a time. So that’s it. Just stay calm and you’ll have the situation under control in no time. It’s time to bring this article to a close now. Hope you had a good read.